2017 was a truly emotional ride for K-drama fans like us. Some of our fave oppas enlisted in the military, some got discharged, a few visited the Philippines, one got very sick, and most of them just melted our hearts. There were epic dating rumors, relationship confirmations, breakups, and even a wedding that everyone just obsessed about. 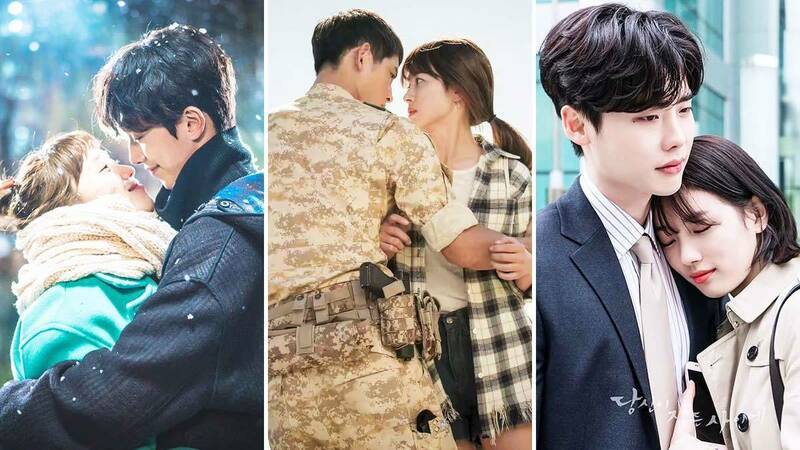 Like in previous years, a handful of K-dramas got us hooked not only with their gripping storytelling but also their picture-perfect power couples. Nam Joo Hyuk and Lee Sung Kyung took the world by surprise when their agency YG Entertainment confirmed that they were dating. But when the same agency announced that the Weightlifting Fairy Kim Bok Joo co-stars broke up, we were devastated. A lot of us, however, are still wishing they'd get back together (or that they're still secretly dating) because Nam-Lee FOREVER!!! Strong Woman Do Bong Soon leads Park Hyung Sik and Park Bo Young got everyone hooked on their undeniable cuteness. Hyung Sik even admitted "loving" Bo Young and sent her a coffee truck post-SWDBS to support her in a new drama and to say he opposes her "marriage." Who else is still hoping that they're like Min-Min and Bong-Bong IRL? Krystal Jung and Gong Myung were second leads in Bride of the Water God, but their chemistry was certainly not second-rate! Those who watched the show can't deny how the pair's steamy kisses and adorable on-screen relationship were so kilig-inducing. If only all those scenes weren't just a fantasy. Lee Jong Suk and Bae Suzy were THE ultimate #relationshipgoals in While You Were Sleeping. Sure, we didn't really root for them to date IRL because we thought #LeeBae (Suzy's couple name with her now ex-boyfriend Lee Min Ho) was forever. Some fans also still ship #JongJoo (as in Jong Suk with W co-star Han Hyo Joo). But the WYWS actors' on-screen chemistry was definitely one of the most memorable in 2017. Dating rumors even erupted that linked the two post-#LeeBae (and even way back in 2014), which proves just how natural their fictional romance seemed. These couples aren't from K-dramas in 2017, but they truly stole the spotlight in their respective fandoms this year. Kim Jong Kook (the guy with the Spartan strength) and Song Ji Hyo (the Ace) always had fans who wished they'd just date. Even when a lot of fans of the variety show Running Man were obsessing about the Monday Couple, there were already shippers of the strongest RM members. And now that Gary is happily married, has a baby, and is out of the RM picture, #SpartAce is totally sailing. Although co-Running Man members jokingly say they don't really ship this pair, Lee Kwang Soo and Jun So Min have amassed fans of their not-so-low-key love affair on the show. Their image on RM as betrayers was just hilarious at first, but later on, fans got intrigued by their naturally affectionate, super kulit, and ~*extra*~ close relationship (Kwang Soo has even met So Min's parents and slept at their home one time!). There must be something going on there, right?! Sandara Park and G-Dragon have always been shipped by K-pop fans. They are close friends and are represented by the same agency YG Entertainment. But very early this year, dating rumors exploded when they were spotted by fans doing some minor PDA after a BIGBANG concert. YG promptly cleared the rumors saying the pair was just joking with fans, but we're all hoping they're secretly dating and just one day admit that there's more to their sweetness than sisterly or brotherly affection. Song Joong Ki and Song Hye Kyo (co-stars from the 2016 K-drama Descendants of the Sun) made every fangirl and boy's wildest dreams come true. They not only admitted to dating last summer, but they announced their impending marriage right away. And on October 31, they got the whole K-drama fandom hooked as they tied the knot. May 2018 be filled with love and wonderful surprises like #SongSong's, too!